There was no shortage of fast runners looking to claim top honours at the Dubai Marathon this Friday. This was despite the fact the the amount of prize money offered up was halved. In the women’s race, Ruth Chepngetich of Kenya won in 2:17:08. Ethiopia’s Worknesh Debele came second with a finishing time of 2:17:41. Both women surpass Tirunesh Dibaba on the all-time list with their finishing times. They are now sitting at third and fourth respectively. The men’s race proved historic as well. Winner Getaneh Molla from Ethiopia provided the fastest marathon debut of all time with his winning time of 2:03:34. Guye Adola, who previously held that honour, also competed in the race. He ended up dropping out shortly after 30 kilometres. Herpassa Negasa and Asefa Mengstu came second and third with times of 2:03:40 and 2:04:24 to secure total Ethiopian dominance on the podium. 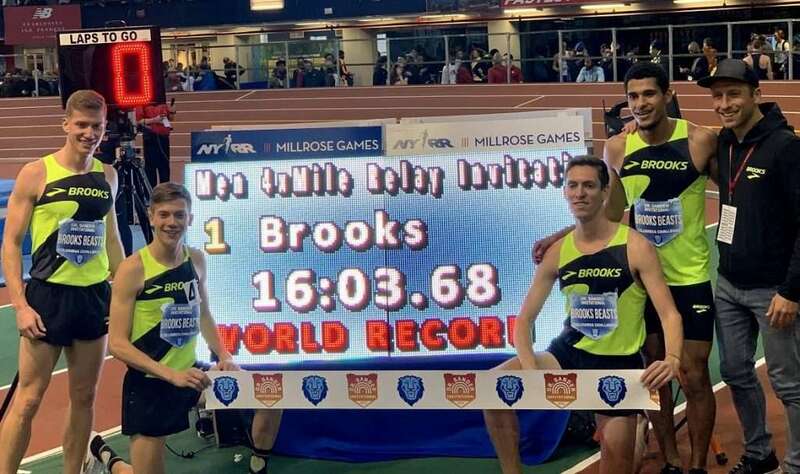 The Brooks Beasts Track Club set a new indoor world best for the 4 x mile relay this weekend. The new world best is 16:03.68, and the relay team consisted of David Ribich, Henry Wynne, Brannon Kidder, & Izaic Yorks. Brooks Beasts runners happy with their new indoor world best. Photo by Letsrun. At the same meet, running fans were excited about high school phenom Katelyn Tuohy’s first showdown against professional runners in the 3000 meters. Tuohy lived up to expectations, coming in third and setting a new indoor high school record in the 3000 meters with her finishing time of 9:01.81. Amanda Eccleston (8:56.68) beat out Heather Kampf (8:56:87) to take the win. Letsrun has the full rundown on the meet. The IAAF World Indoor Tour kicked off in Boston this weekend, and Ethiopian Yomif Kejelcha, now with the Nike Oregon Project, took the spotlight by winning the mile in 3:51.70. Afterwards, Kejelcha announced that he was looking to take down Kenenisa Bekele’s 12:37.35 5000 meter World Record this year. Surely that is a step too far, even for the NOP crew? Kejelcha’s current PB in the 5000m is 12:46.79 from Bruxelles, where he essentially paced Selemon Barega to 12:43.02. Another notable performance from the same meet was Hagos Gebrhiwet 7:37.41 in the 3000m, where he beat out Ed Cheserek, who came in five seconds behind. Read more about the event at the IAAF website.